Jessie J has tweeted a photo of her brand new single cover, featuring a picture of her having a right old chuckle. The song, which is the fourth track to be released from Jessie's album 'Who You Are', is about being able to prove bullies wrong. 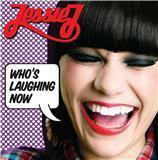 "My new DP is the official Single Cover for #whoslaughingnow #beatbullying :) " Jessie posted. Jessie J's 'Who's Laughing Now' will be available to buy on Sunday 28th August.